OIG conducts audits and investigations on behalf of the American public to improve the performance and integrity of DOT’s programs to ensure a safe, efficient, and effective national transportation system. The United States will achieve a safer, more efficient, and more effective national transportation system because OIG enhances the performance and integrity of the DOT’s programs. OIG also will serve as a model Federal agency by maintaining a workplace culture that values its people as it continuously improves its performance. Safety is DOT’s highest priority and central to OIG’s identity. OIG is committed to conducting effective audits and investigations of DOT’s programs and operations to reduce fatalities and injuries across all modes of transportation. Accountability is at the heart of OIG’s work. Through independent and fair audits and investigations, OIG seeks to ensure that all DOT agencies are accountable for their results and for the resources the public invests in them. Integrity is OIG’s foundation. OIG maintains the highest standards of integrity in its work for the American people, Congress, the Secretary, and senior Department officials, and strives to set the example for objectivity, independence, accuracy, and transparency. The Office of Inspector General works within the Department of Transportation to promote effectiveness and head off, or stop, waste, fraud and abuse in departmental programs. We do this through audits and investigations. OIG also consults with the Congress about programs in progress and proposed new laws and regulations. The Inspector General Act of 1978 gives the Office of Inspector General autonomy to do its work without interference. The Inspector General is chosen by the President, not based on political affiliation but rather on integrity and ability. IG candidates can show accomplishment in several fields, including accounting, auditing, law, financial or management analysis, public administration or investigations. Inspector General appointees are subject to Senate confirmation. Only the President has the power to remove an inspector general and the reasons for doing so must be communicated to Congress. The Inspector General Act of 1978 prevents officials in the scrutinized agency from interfering with audits or investigations; it also requires the IG to keep the Secretary of Transportation and Congress informed of findings. However, much of OIG's most significant work is accomplished with the cooperation of the officials whose programs are being reviewed. On January 23, 2015, former Secretary of Transportation Anthony Foxx highlighted his support for ongoing cooperation with the Office Of Inspector General through a Department-wide memorandum. In his memorandum, the Secretary reminded DOT employees of their duty to cooperate with the OIG in fulfilling our responsibilities under the Inspector General Act, including providing information and assistance in a timely manner. How does the Office of Inspector General keep the Department and Congress up to date on findings? We provide our audit reports to the affected Operating Administrations and to the appropriate Congressional committees as soon as they are completed. Twice a year, we also publish Semiannual Reports, which summarize recent audits and investigations. Cases of particular public interest go out to the media as news releases. Do audits and investigations ever turn up anything besides bad news? Absolutely! Many of our reviews determine that departmental programs are working effectively and report on how effective programs can be further enhanced with additional changes. 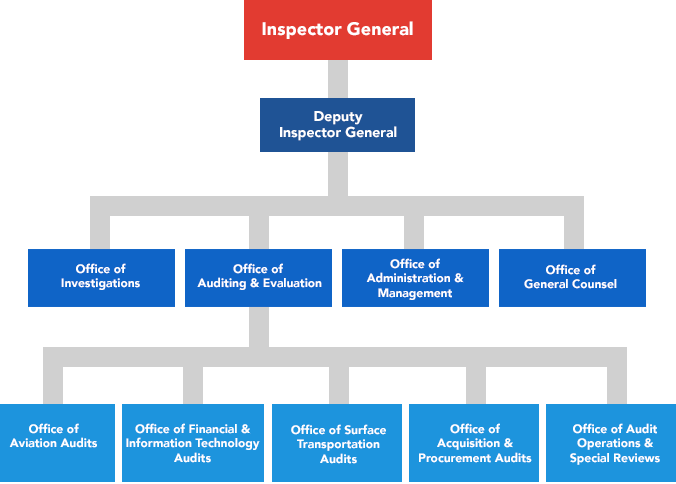 How does the Office of Inspector General choose the programs to audit or investigate? Some audits are required by law. Others are requested by key decisionmakers, such as the Secretary of Transportation, officials from DOT's Operating Administrations, or members of Congress. We also establish our own audit priorities, weighing such factors as impact on safety, developing issues, and DOT's strategic goals. On the investigative side, we launch probes based on referrals from DOT Operating Administrations, when we suspect a pattern of criminal behavior, or based on complaints to OIG's Hotline. Are audit results made public? Most audit reports are public documents and are available on this Web site. If you are interested in an older audit report cannot be found on our Web site, please call the Director of Audit Planning, Management, and Technical Support at 202-366-1453. Audit reports containing proprietary or non-public information should be requested through OIG's Freedom of Information Act Officer at 1200 New Jersey Avenue SE, Mail Stop J-3, Washington, DC 20590, or by telephoning (202) 366-6131. I work for a Federal agency. I think the Office of Inspector General may want to ask me some questions for an audit or investigation. What do I have to do? DOT regulations require Federal employees to cooperate with OIG audits and investigation, or face possible administrative action. Cooperation means testifying, if asked, and providing information relating to the performance of your job-related duties. Employees are also responsible for reporting violations, or suspected violations, of the law or any abuse, waste, mismanagement or irregular activities regarding DOT programs to the Office of Inspector General. Keep in mind that cooperating with an OIG audit or investigation does not curtail an individual's Fifth Amendment right not to incriminate oneself. In addition, Federal laws protect employees from reprisal by employers for "blowing the whistle" on illicit activity. Click here to learn more about whistleblower protection. What is the difference between DOT regulatory enforcement and OIG law enforcement? DOT Regulates: DOT and its Operating Administrations issue a wide variety of Federal transportation regulations, and a number of Operating Administrations have broad regulatory enforcement and compliance authority. Some Operating Administrations may enforce regulatory violations by imposing civil penalties or revoking relevant authority. For example, FMCSA may issue an out-of-service order revoking a non-compliant commercial motor carrier’s operating authority. The Department must refer any allegations of fraud, waste, abuse, or other suspected violation of law by a DOT employee, contractor, or grantee affecting the Department or its programs to the Office of Inspector General. OIG Investigates: By contrast, OIG neither issues nor enforces DOT regulations. Rather, we are an independent audit and law enforcement agency authorized by statute to investigate allegations of fraud, waste, abuse, and other violations of law by a DOT employee, contractor, or grantee. We work with our Federal, State, and local prosecutorial and law enforcement partners to prosecute to the fullest extent of the law those who would violate the Nation’s transportation-related laws and regulations. We serve as the sole in-house source for objective examination of DOT’s programs and their integrity, and we are required to keep both Congress and the Secretary of Transportation fully and currently informed of problems and deficiencies related to those programs. Learn more about our audit process or our investigative process, priorities, and law enforcement authority. Does OIG help put criminals behind bars? Yes. Read summaries of our recent cases. Does OIG have law enforcement authority? Yes. Click to learn more about our Federal law enforcement authority. What does OIG’s law enforcement component do? OIG’s Office of Investigations is comprised of criminal and general investigators responsible for conducting criminal, civil, and administrative investigations of fraud and other allegations affecting DOT, its Operating Administrations, programs, contractors, and grantees. We focus our efforts on top priority areas involving crimes relating to transportation safety, grant and procurement fraud, consumer and workforce fraud, and employee integrity violations. Are OIG special agents authorized to carry firearms? Yes. OIG special agents are Federal law enforcement officers who are trained and authorized to exercise law enforcement authority to make warrantless arrests, obtain and execute search and arrest warrants, and carry firearms in the performance of their duties. Click to learn more about OIG special agents’ law enforcement authority. What is OIG’s investigative process? Learn about OIG’s investigative process.